In high manganese steels it is possible to get significant improvements in the tensile ductility even at cryogenic temperatures as long as the number of ε-martensite plates is controlled. As the name suggests, high-Mn steels are based on alloying Fe with a large amount of Mn (≥12 wt%). This makes the Fe-Mn equilibrium phase diagram an excellent starting point to understand their behavior. 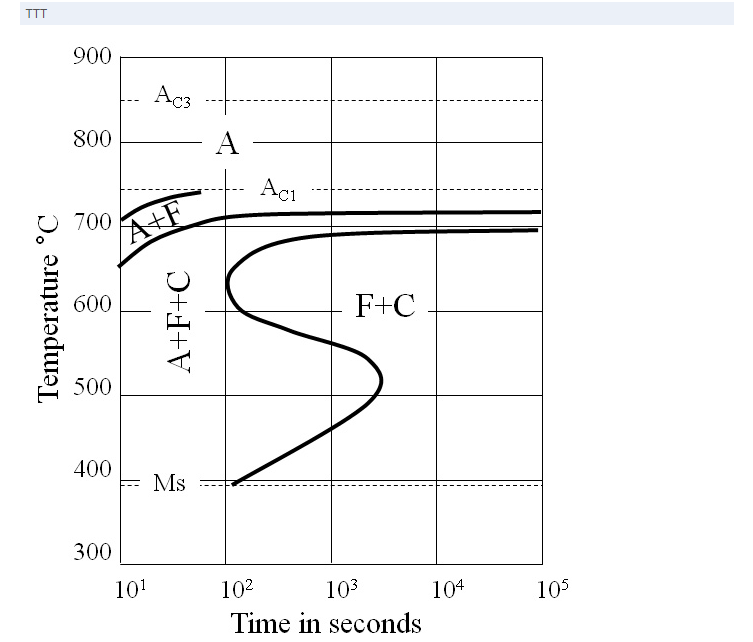 Figure 1 presents the equilibrium phase diagram of the Fe-Mn system. As can be seen, increasing Mn content significantly expands the austenite (γ) phase field. 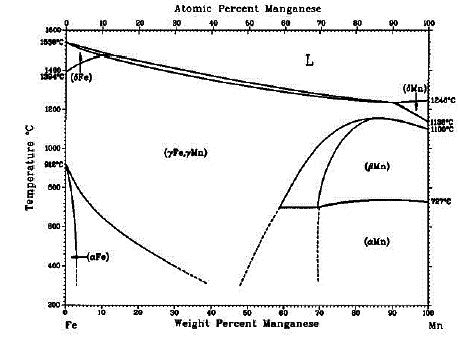 High temperature ferrite (δ) formation is suppressed by an addition of approximately 12-13 wt% Mn, indicating that alloys with this amount of manganese or more will exhibit fully austenitic solidification from high temperature. Another feature of interest in the Fe-Mn system is that the two phase region separating liquid (L) and austenite (γ) is quite narrow, suggesting that Mn does not segregate strongly during solidification. Estimating the partition ratio from the diagram itself gives a value of approximately 0.75. Although slightly outside of the data presented in Figure 1, a eutectoid reaction exists in the system at 255°C and 43 wt% Mn; γ→αFe+αMn. From a practical standpoint, the high-Mn alloys which are discussed here would not demonstrate any low temperature ferrite (αFe) formation during typical cooling conditions because of limited diffusion rates. High manganese austenitic steels have been widely studied for their corresponding outstanding tensile strength and ductility. 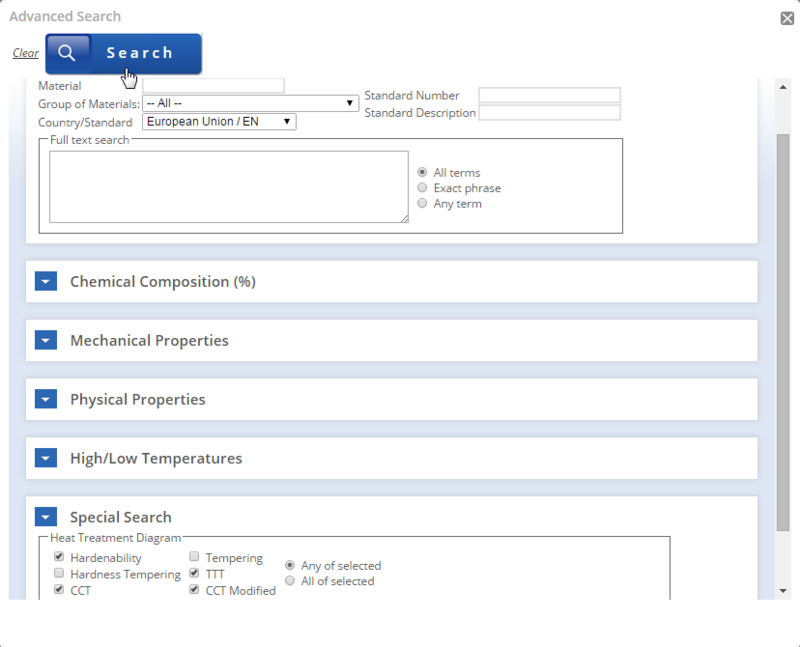 Certain high Mn austenitic steels have also been investigated for cryogenic applications. Koyama et al. 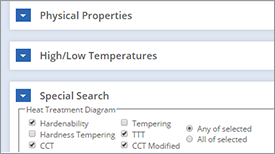 studied the effects of temperature on the tensile properties of Fe-17Mn-0.6C steels and discovered that the uniform tensile elongation deteriorated as the deformation temperature decreased from room temperature to −100°C. The lower ductility was attributed to an increase in the amount of ε-martensite plates. This suggestion was supported by the observation that an addition of elements such as carbon, which suppressed the formation of ε-martensite, improved the cryogenic tensile ductility. Therefore, it has been suggested that the reduction number of ε-martensite plates is a key factor for the cryogenic tensile ductility improvement of high Mn steels. One way for the number of ε-martensite plates to be suppressed is through austenite grain size refinement . Takaki et al. investigated the grain size effects on ε-martensite formation in Fe-15Mn alloys and discovered that when the grain size was below 10 µm, the ε-martensite transformation was almost suppressed. In a quite recent study, it was demonstrated that Fe-17Mn-0.6C alloys with coarse grain sizes (10–37 µm) demonstrated a brittle fracture at −150°C due to ε-martensite formation. In contrast, this embrittlement was suppressed by grain refinement to 3.5 µm. The formation of ε-martensite could also be suppressed by an increase in the Mn content. Tomota et al. 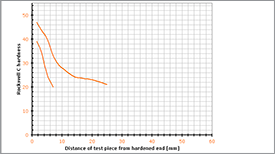 demonstrated that, regarding the binary Fe-Mn system, when the Mn content was increased to 36%, no ε-martensite was observed in the tensile tested samples at room temperature, whereas only 4.2% of ε-martensite was formed following tensile deformation to a strain value exceeding 60% at the liquid nitrogen temperature. 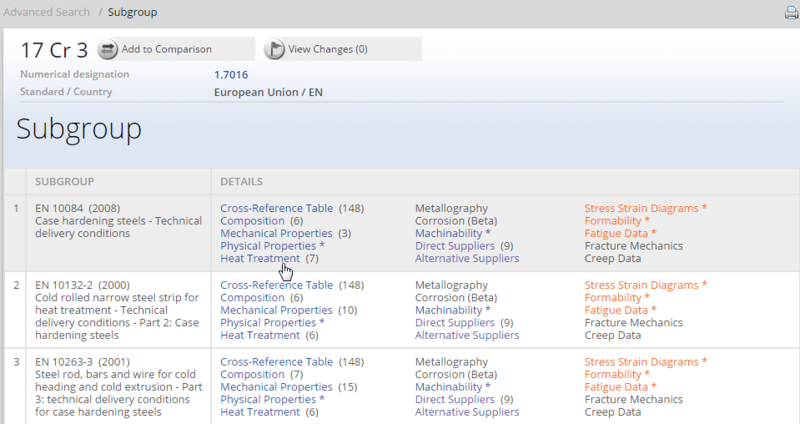 Fe-34.5Mn-0.04C steels are recently developed steels with potential applications at low temperatures. Among 9% nickel steel, austenitic steel, aluminium alloy and austenitic Fe-Ni alloy that are materials applicable to LNG tanks, the three except for 9% nickel steel have a FCC crystal structure. Metallic materials with FCC structure do not show the property of ductile-brittle transition unlike those with common Body-Centered Cubic (BCC) structure. Thus, they maintain high toughness also at cryogenic temperatures. 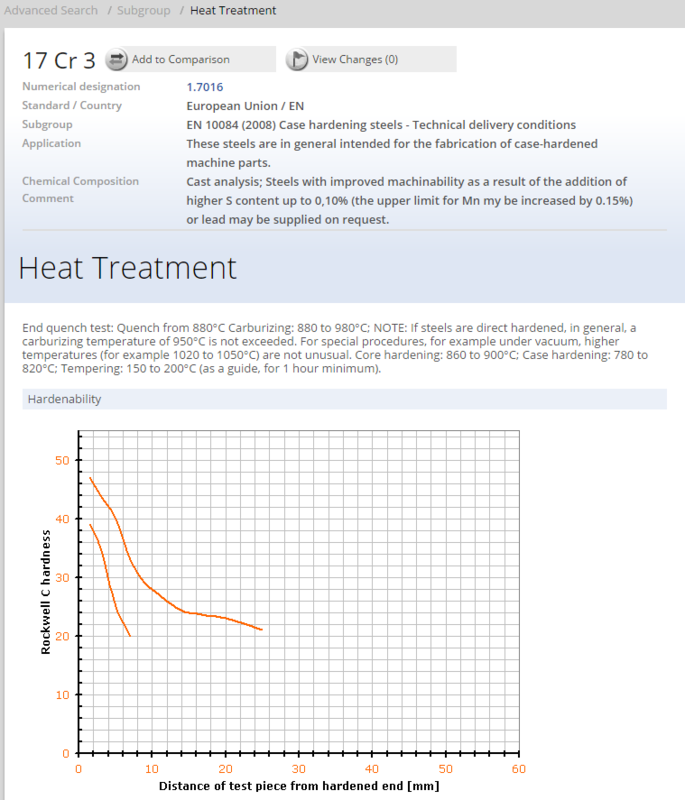 An exception is the 9% nickel steel, which has the residual FCC structure with a basis of Body-Centered Tetragonal (BCT) structure due to a special heating process that ensures toughness at cryogenic temperatures. 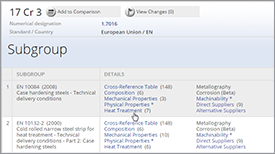 Mechanical properties of high Mn steel were tested in accordance with international standard procedures as seen in Table 2. They were clarified through a comparison with other materials used for LNG tanks shown in Table 3. 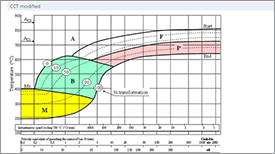 Particularly, Type 304 was chosen to represent austenitic stainless steel. 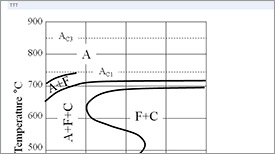 In Figure 1(a) is showed, yield strength of high Mn steel. As can be seen the yield stress is between those of Type 304 (equivalent to STS 304 in Korean Standards) and 9% nickel steel. In terms of ultimate tensile strength, it shows superiority over every type of metallic material in comparison. High Mn Steel recorded an elongation of around 80% of that of Type 304 and around 1.8-fold of that of 9% nickel steel. 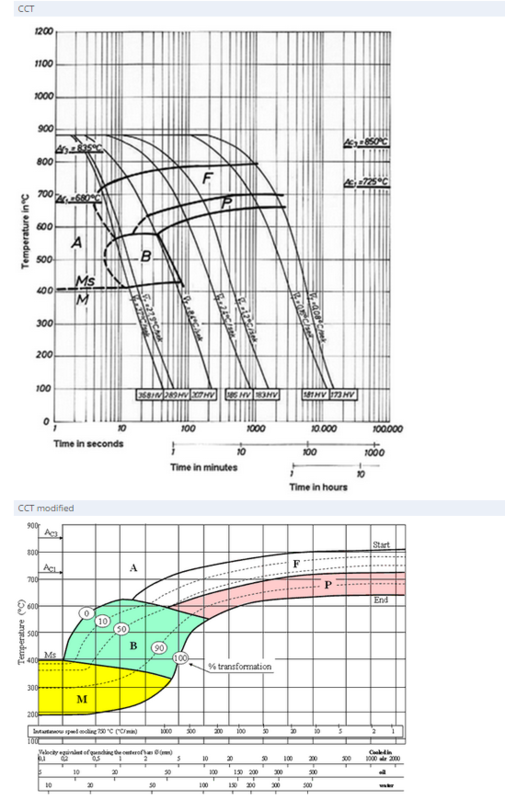 (a) Comparison with other cryogenic (b) Variation with respect to temperature Materials (25°C) Figure 1(b) shows the yield strength and ultimate tensile strength of high Mn steel increase monotonically and its elongation decreases, as test temperature decreases. 3. Suitability of High manganese austenitic steel for cryogenic service and development of any necessary amendments to the IGC code and IGF code, CCC 3 8 Technical information regarding high manganese austenitic steel for cryogenic service, 2016, Accessed NOV 2018.